Behind That Curtain (1929) - Dreadful mystery/melodrama from Fox and director Irving Cummings has a couple of noteworthy details. 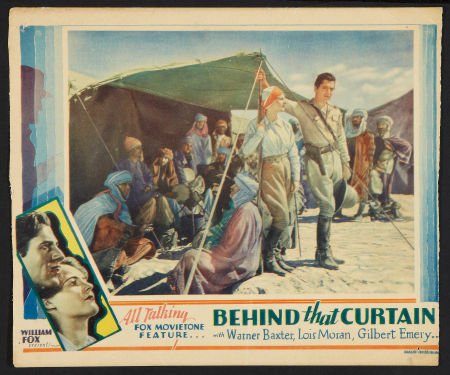 John Beachum (Warner Baxter) is a dashing explorer, back in London in order to set up his next excursion, this time into the "Persian desert of India". His best friend is Eve Mannering (Lois Moran), and Eve is thrilled to inform John that she's met the man she wants to marry: Eric Durand (Philip Strange). However, Eve's wealthy uncle Sir George (Claude King) disapproves, and he's hired a detective to dig up dirt on Eric. When the detective is murdered, Eve and Eric quickly marry and move to India. Scotland Yard inspector Sir Frederick Bruce (Gilbert Emery) is on the case, and he'll solve it even if it means traveling half the globe to track down the culprit. 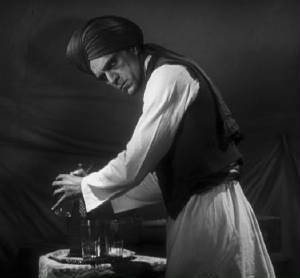 Also featuring Boris Karloff, Jamiel Hasson, John Rogers, Edgar Norton, Mercedes De Valasco, and E.L. Park as Charlie Chan. Source: YouTube, a very good print. Park as Chan on right. The Canary Murder Case (1929) - Second outing for William Powell as detective Philo Vance. He's out to solve the murder of the Canary (Louise Brooks), an amoral showgirl with her claws in a lot of men, producing a big pool of suspects. But Vance is doubly concerned since one of them is the son (James Hall) of one of Vance's oldest friends (Charles Lane). Also featuring Eugene Pallette as series regular Sgt. 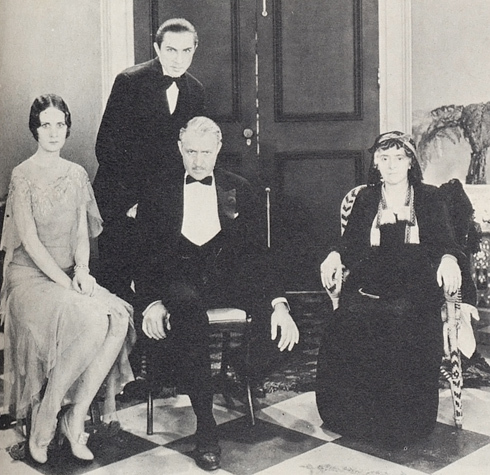 Heath, Jean Arthur, Lawrence Grant, E.H. Calvert, Louis John Bartels, Ned Sparks, and Gustav von Seyffertitz. 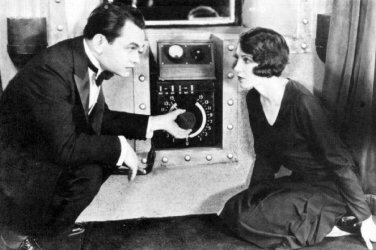 The Greene Murder Case (1929) - First or second (more on that later) entry in the Philo Vance detective series. William Powell stars as the posh NYC private sleuth who works with gruff police Sgt. Heath (Eugene Pallette) to solve high-profile murder. In this case, members of the wealthy Greene family are dropping dead. Due to a provision in the former patriarch's will, all of the family members must live under the same roof for 15 years to earn their inheritance, despite the fact that they openly loathe one another. Vance must find the culprit before there are no more Greens left. Also featuring Jean Arthur, Florence Eldridge, Ullrich Haupt, E.H. Calvert, Gertrude Norman, Lowell Drew, Morgan Farley, Brandon Hurst, and Augusta Burmeister. The Hole in the Wall (1929) - Morally ambiguous crime drama from Paramount and director Robert Florey. A criminal gang, led by the "Fox" (Edward G. Robinson), hides behind the facade of a spirit medium named Madame Mystera. When their usual Mystera gets killed in an accident, they hire Jean Oliver (Claudette Colbert), a recent parolee looking for revenge against the woman who unjustly sent her up the river. The gang kidnaps the woman's young granddaughter for ransom, while intrepid newspaper investigator Gordon Grant (David Newell) tries to get to the bottom of things. Also featuring Donald Meek, Nellie Savage, Alan Brooks, Louise Closser Hale, Katherine Emmet, and Marcia Kagno. 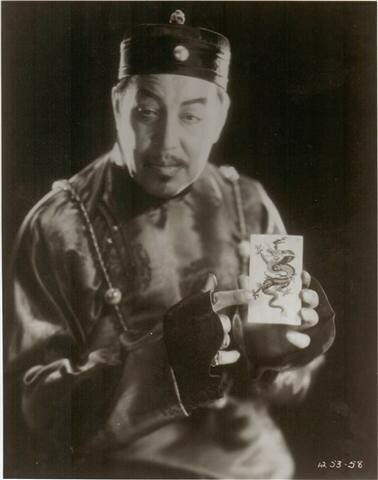 The Mysterious Dr. Fu Manchu (1929) - Paramount released this first sound version of Sax Rohmer's literary super-villain. During the Boxer Rebellion, wealthy Chinese businessman Dr. Fu Manchu (Warner Oland) swears revenge after British military shelling kills Fu's wife and son. His plan takes many years to come to fruition, and utilizes the hypnotized English girl (Jean Arthur) that he's raised to be his unwitting agent. 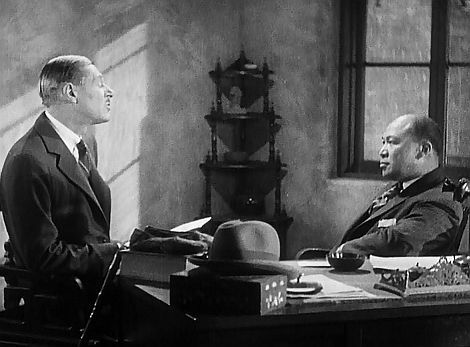 Fu Manchu runs into trouble, though, when Inspector Nayland Smith (O.P. Heggie) and Dr. Jack Petrie (Neil Hamilton) try to stop his mad quest for vengeance. Also featuring William Austin, Claude King, Charles A. Stevenson, Evelyn Selbie, and Noble Johnson. Nice write ups. I would really love to see some of those early Jean Arthur movies even if her screen persona wasn't fully developed and \ or her roles\characters were fairly bland. In wouldn't be until the gangster farce The Whole Town's Talking, with Edward G. Robinson that Jean made her big splash into stardom. 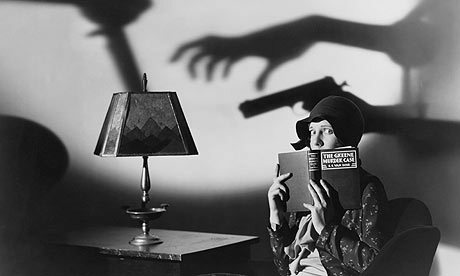 The Studio Murder Mystery (1929) - Creaky but mildly amusing mystery from Paramount and director Frank Tuttle. When womanizing actor Richard Hardell (Fredric March) ends up dead in the middle of production on a new film, there are plenty of suspects. Sharp-witted screenwriter Tony White (Neil Hamilton) tries to solve the case while also solving script issues, much to the annoyance of police Lieutenant Dirk (Eugene Pallette). Also starring Warner Oland, Doris Hill, Florence Eldridge, Guy Oliver, Donald Mackenzie, Gardner James, Mischa Auer, E.H. Calvert, and Chester Conklin. 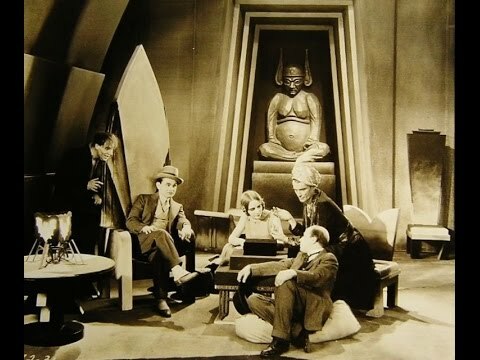 The Thirteenth Chair (1929) - Antique mystery from director Tod Browning and MGM. When an Englishman is murdered in Calcutta, a large seance is planned, to be presided over by Irish spirit medium Madame La Grange (Margaret Wycherly). Also in attendance will be police Inspector Delzante (Bela Lugosi), determined to catch the culprit. Also starring Conrad Nagel, Leila Hyams, Helene Millard, Holmes Herbert, Mary Forbes, John Davidson, Charles Quatermaine, Cyril Chadwick, Moon Carroll, Frank Leigh, and Clarence Geldart. I'm certainly a big fan of classic mysteries, so I'll be an active participant in this thread. In fact, I've started threads on this topic on other forums. For now, I'd just like to comment on some of the mysteries mentioned here. Behind that Curtain: I've read the original source material, and it would have been nice if they'd stuck to the book. In the novel, Chan investigates several murders/incidents from the past and present, and he has to show how they're connected. The novel isn't a melodrama at all. Still, I like the film. I recommend you read the book, if you can find it. A Spanish language version of Charlie Chan Carries On exists: Eran Trece (1931). Excellent film, in my opinion. 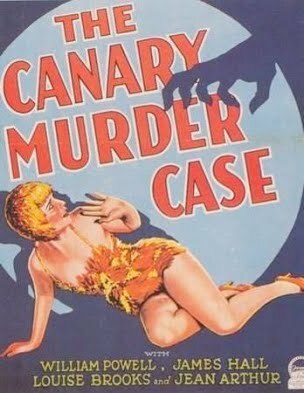 The Canary Murder Case: starts out well, but falls apart later and it's extremely predictable. 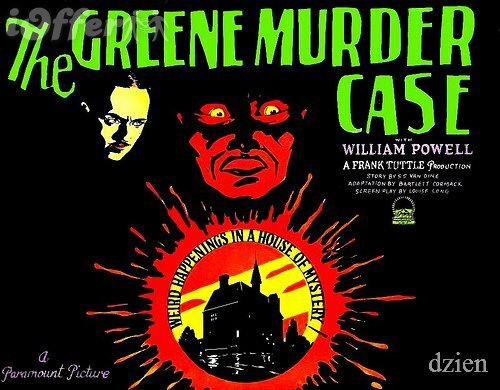 The Greene Murder Case: can't go wrong with the isolated house mystery. I like this film. The Hole in the Wall: poor beginning, but really picks up afterwards. This is a classic case of a movie which does NOT need music to bring out emotion in people during the suspenseful scenes. Good luck finding a modern film which is like this. If this movie had been made in the past 35 years, it would Certainly Have a Sappy Soundtrack. 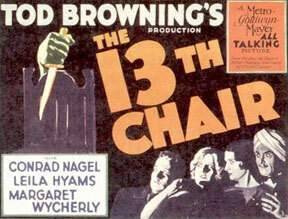 The 13th Chair: I found the 1929 film a bit hard to get through. I do love Bela Lugosi in it. I recommend the 1930s film. That one's really good. I look forward to more chats on this thread. 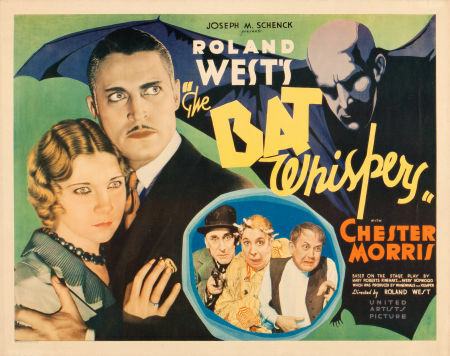 The Bat Whispers (1930) - "Old dark house" style mystery comedy, based on the play by Avery Hopwood and Mary Roberts Rinehart, and directed by Roland West. There's an infamous thief and murderer known as The Bat on the loose, a man so sure of his superiority that he not only warns the police ahead of time about his crimes, he even warns his victims! After his latest brazen crime, the scene shifts to a large mansion, where the matronly Cornelia Van Gordner (Grayce Hampton) lives with her niece Dale (Una Merkel) and a nervous wreck of a maid, Lizzie (Maude Eburn). A motley assortment of people begin arriving, including a new gardener (William Bakewell), a shady doctor (Gustav von Seyffertitz), a relative of the house's former occupant (Hugh Huntley), and dapper detective Anderson (Chester Morris), among others. There are also more than one masked menaces lurking about, including the notorious Bat, and everyone runs to-and-fro through hallways and secret passages, trying to figure who is after what and why they are all here. Also featuring Richard Tucker, Chance Ward, Wilson Benge, DeWitt Jennings, Sidney D'Albrook, Spencer Charters, Charles Dow Clark, and Ben Bard as The Unknown. The Benson Murder Case (1930) - Third sound Philo Vance mystery, from Paramount and director Frank Tuttle. Vance (William Powell) is on the case when Wall Street hotshot Anthony Benson (Richard Tucker) is murdered following the stock market crash. The list of suspects includes several people who lost big in the crash under Benson's watch, but the victim was also a regular jerk, so the motive could be unrelated to money, too. Also featuring Eugene Pallette as police Sgt. Heath, William Boyd, Paul Lukas, Natalie Moorhead, May Beatty, Mischa Auer, Guy Oliver, and E. H. Calvert. I saw the original The Bat movie (silent film) and I admit that I had some trouble getting through it. I much prefer The Cat and the Canary from the late twenties. From the Philo Vance movies, I really like The Kennel Murder Case, The Greene Murder Case, and The Dragon Murder Case...along with parts of The Canary Murder Case. I had a chance to read some of the Philo Vance books. I liked the novel The Bishop Murder Case, but couldn't get through the movie. I didn't finish The Benson Murder Case (the novel and the film). Not my style. I didn't finish The Benson Murder Case (the novel and the film). Not my style. I have to ask about this comment. Having just watched three of the Vance films, I didn't see any real stylistic differences between them. What was it about this one that stood out for you? The storyline just didn't appeal to me. I probably should give it another chance. 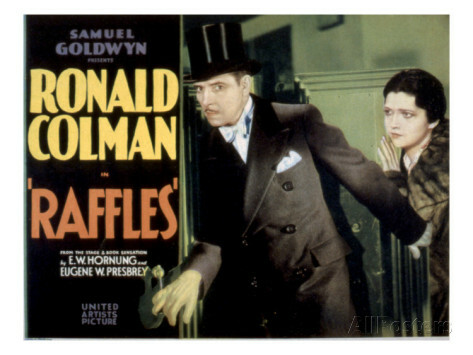 Raffles (1930) - Breezy crime caper/romance based on the book by E.W. Hornung, directed by George Fitzmaurice, and released by United Artists. Ronald Colman stars as A.J. Raffles, a sophisticated English gentleman who also happens to be an expert jewel thief. The police are hot on his trail, led by Inspector McKenzie (David Torrence), while Raffles is distracted by his romance with beautiful socialite Gwen (Kay Francis). Can Raffles win the girl, get the jewels, and get away scot-free? Also featuring Frederick Kerr, Bramwell Fletcher, John Rogers, Wilson Benge, Frances Dade, Virginia Bruce, and Alison Skipworth. 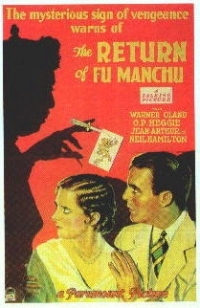 The Return of Dr. Fu Manchu (1930) - Warner Oland returns as the title super-villain in this follow-up from director Rowland V. Lee and Paramount Pictures. His death by poisoning at the end of the first film turns out to have been a ruse, and the still living and scheming Chinese mastermind is determined to have his revenge for the death of his wife and son at the hands of the British military. He decides to focus on the family of the first film's hero, Dr. Jack Petrie (Neil Hamilton), now set to wed Fu's adopted English daughter Lia Eltham (Jean Arthur). It's once again up to Inspector Nayland Smith (O.P. Heggie) to thwart the arch-fiend of the Orient. Also featuring Evelyn Hall, William Austin, Margaret Fealy, Shayle Gardner, Evelyn Selbie, Toyo Fujita, and Tetsu Komai. Source: archive.org, although the copy has very bad sound. Sinners' Holiday (1930) - Short but decent pre-code crime drama from Warner Brothers and director John G. Adolfi. Grant Withers stars as Angel, an ex-con working as a barker and handyman on the boardwalk. He starts working for Ma Delano (Lucille La Verne), a feisty old woman who dotes on her youngest son Harry (James Cagney). While Angel makes time with Ma's daughter Jennie (Evalyn Knapp), Harry gets mixed up with bootlegger Mitch (Warren Hymer) as well as opportunistic boardwalk model Myrtle (Joan Blondell). Also featuring Noel Madison, Otto Hoffman, Hank Mann, Ray Gallagher, and Purnell Pratt. 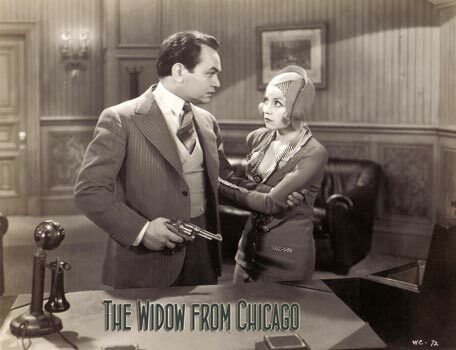 The Widow from Chicago (1930) - Brief gangster movie from First National and director Edward Cline. Alice White stars as Polly Henderson, a sweet girl who is devastated when her policeman brother is killed in the street. She pretends to be the widow of a notorious crook so that she can get a job in the nightclub of gangster Dominic (Edward G. Robinson). She thinks he may have had a hand in her brother's killing, and she wants to find the evidence to convict him. Things get complicated when the supposedly dead crook that she was supposed to be married to, Swifty Dorgan (Neil Hamilton), shows up alive and well. Also featuring Frank McHugh, E.H. Calvert, Lee Shumway, Brooks Benedict, Betty Francisco, and Harold Goodwin. Despite the fact that I'm a huge fan of mysteries & thrillers, I have never liked Raffles or any other "gentleman thief". Not sure why exactly. There's also a film from the early 30s starring William Powell as a gentleman thief (not Raffles, but some other one) and I couldn't even finish it. Yeah, it seems like a weird sub-genre. I also have the 1939 version with David Niven waiting to be watched. I may also have the Powell movie, too. I generally like Colman, so he carried the film for me, and I also liked Kay Francis in it. Jewel Robbery is the Powell movie which also have Kay Francis. (Kay was a good match with these gentlemanly thieves). Normally I like the gimmicks which mystery authors of the time came up with, but the "gentleman thief" really makes no sense to me. I also couldn't get into any of the Maigret stories/episodes/films which I've tried to watch. He's a cop and they focus too much on the police procedures, etc. I'm much more into Agatha Christie, Ellery Queen, John Dickson Carr, Mignon Eberhart, and some others. I'll post reviews once I watch these films, read the books, or hear the radio plays. I don't have much time in the next couple of weeks, but by mid-October, I'll be more active. It also features some marijuana if I remember right. Yes, there is; the gentlemen thief makes his victims smoke the stuff so they are confused when interviewed by the police. The stuff one finds only in a pre-code (well until the late 50s \ 60s). 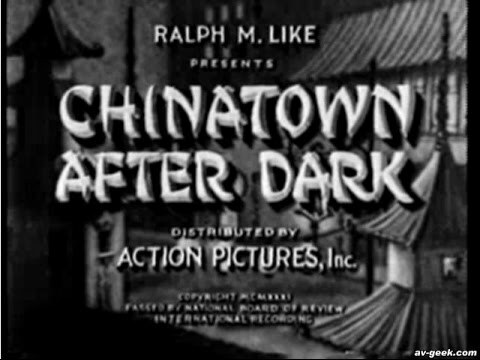 Chinatown After Dark (1931) - Forgettable poverty row crime flick from Action Pictures and director Stuart Paton. Madame Ying Su (Carmel Myers) runs a Chinatown criminal gang out of her innocuous tea shop. She orders her men to obtain a fabulous jeweled dagger being brought into the country by Ralph Bonner (Frank Mayo), who is to present it to Le Fong (Edmund Breese). When Ralph goes missing and Fong is killed, the former's brother Jim (Rex Lease) starts investigating with the help of Fong's adopted daughter Lotus (Barbara Kent). Also featuring Billy Gilbert, Michael Visaroff, Laska Winter, and Willie Fung.